Morning. I’m back from Utah. Arrived home last night and dissolved into pathetic tears on my sofa. Tears! Partly because I was home after such a magnificent trip (I’m writing it up for Toff Gear so I’m not going to wang on about it here), partly because I’d slept for about three hours while in Utah and partly because a plumber had just come round and been unable to fix a mysterious and depressingly expensive-looking leak in my basement. Anyway, I went to bed at 8pm and today life is all sunbeams again. Sleep’s brilliant, isn’t it? Sunday Telegraph column below. I am getting to the bottom of why some of my columns appear under the exciting label of ‘premium’ on the Telegraph website and some don’t. In the meantime, I’ll just paste it here. More about marmalade am afraid. It’s been a rough week in the Money-Coutts household. A rough old week indeed. Not because we’ve been worrying about Trump or whether the new Doctor Who should be a black woman. 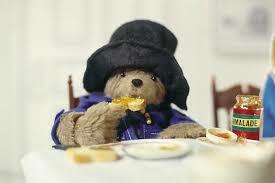 But because of the troubling news about marmalade. It’s dying out. Didn’t you hear? Apparently it’s only the coffin dodgers buying it now. ‘Experts put marmalade’s fading appeal down to its old-fashion image and Millennials distaste for ‘bits’ in spreads,’ said a Telegraph report. Marmalade’s origins are hazy. The Romans created it, say some, by boiling quinces with honey. Others insist it was invented around 1700 when a Spanish ship carrying Seville oranges was wrecked off Dundee and a local merchant gathered the bobbing fruit up and carried them home to experiment in his kitchen. Then there’s the frankly fanciful story that its name came about when some orange paste was used to cure a seasick Mary Queen of Scots, crossing from France (‘Marie est malade’), although as anyone who’s ever been seasick knows, a jar of jam would be no use at all unless it was used to knock oneself out. What you will not find on this duke’s table is Nutella or peanut butter, both of which have been fingered for the decline in marmalade’s popularity because they’re ‘smoother’. Well I’m sorry but chocolate for breakfast is the sort of thing the French go in for, and the only sort of butter that should be on this table is butter which descends from a cow. No peanut butter, no almond butter, no walnut butter and so on. Bonne Maman with its gingham lids is slightly faux posh, the sort of jam you buy to give your north London, brushed steel kitchen a whiff of Provence. Honey is a neutral spread, but only if it’s not manuka. Very middle class to bang on about manuka. Marmalade remains the king of them all. My family is obsessed with it. On toast, on crumpets, on sausages (it is especially excellent on sausages). The beginning of the year, for my mother, is no time to rest after the excesses of December. It is a time to stockpile Seville oranges and stand over great vats of steaming sugary liquid making sure it boils to precisely 104 degrees. This year, it’s been a particularly frenzied process because Mum has entered the World Marmalade Awards, which will be judged in two weeks’ time in Cumbria. She entered a few years ago but was marked down by the local WI on the basis that her peel wasn’t quite cooked, an accusation which has rankled ever since. Look sharp Penrith, we’re coming for you.